Parents want to keep the power of governing our schools in the hands of the people who live and work in the communities they serve. School ratings and the quality of education are the primary reasons most people have for choosing to buy their homes. Once you tamper with the integrity of a town’s educational system, push back is inevitable. This is exactly what is happening now. These proposals are attracting a lot of attention and Hartford needs to listen. I would offer this observation as a former local board of education chair, State Board of Education member and as a leader on the General Assembly’s Education Committee: Don’t change Connecticut’s locally controlled education model. Let local boards decide what works for them. Different communities have different populations, different needs and curriculum standards, and most important, research shows that smaller schools and classrooms provide for better outcomes, especially as our special education student population increases and classroom demands grow. Forcing schools to consolidate at this time, when residents are leaving, could erode our state’s best remaining asset — our schools. It is revealing that bills that would mandate regional schools do not mention instructional quality, the factor of greatest importance to parents. The only reason given by those pushing hard to pass these proposals is cost efficiency. Improving education quality should be the number one consideration for legislators if they care about protecting our state’s remaining competitive economic advantage. 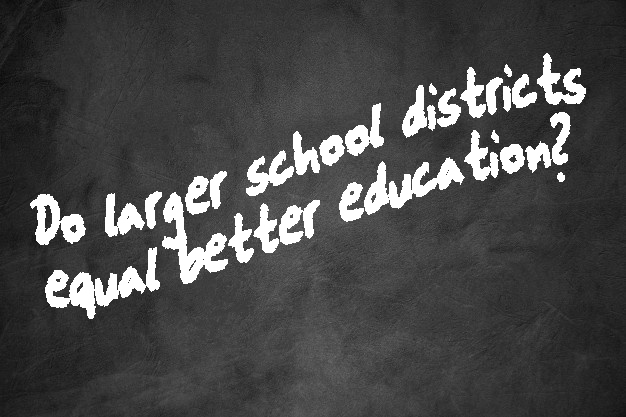 In fact, research suggests that finding ways to deconsolidate, or allow larger districts to form smaller, more manageable groups within their larger jurisdiction, may be more cost effective than consolidation. A 2018 report by the Hartford Foundation for Public Giving (K-12 Regionalization Report in Connecticut) challenges the premise that quality education will be preserved or costs best contained through consolidation. “Contemporary consolidation suggests that new consolidation is likely to result in neither greater efficiency nor better instructional outcome.” Instead, they report that deconsolidation of large districts may actually save costs. “In some cases, reductions in K-12 costs might be obtained by deconsolidation – breaking up large districts. Estimates were done comparing the cost savings from regionalization versus deconsolidation in Michigan. Two hypothetical scenarios showed that consolidating small districts to 2,900 students might result in a cost savings of about $31 million annually. In contrast, breaking apart districts larger than 2,900 might result in an annual cost savings of about $363 million.” That $332 million difference would be vast, nearly tenfold. Instead of threatening to dismantle what works for the vast majority of towns, efforts should be directed at giving towns more flexibility, not less. School districts could better contain costs and achieve greater efficiencies if legislators provide for more flexible cooperative agreements and reduce red tape, and unfunded mandates. The new governor seems to be listening. However, even if our new governor disagrees with the proposals by Senate and House leadership, they still control the process, the bills and the votes. Barring a sustained veto, the legislature will ultimately make the final decision. Those proposing these bills say towns will have the option to reject them. However, the loss of education, special education, transportation, school construction and other funds would make for strong and costly disincentives to do so. Hartford should fix what’s broken –high debt and high costs– and let communities govern their own successful school systems. If legislators focus on improving our business climate and returning Connecticut to its former prominence, all schools will benefit. Bottom line: Education is best managed in a “bottom-up” environment by parents, educators and local boards of education.